Eighty years ago, on April 26, 1937, the Spanish villa Guernica was bombed by German planes, known as the Legion Condor, sent by Hitler. The savage purpose, rather than helping Franco, was to test the destructive capacity of the Heinkel He 111, the Dornier, the Junker, and the Messerschmitt, bearers of the most advanced technology of that time. The bombing lasted three hours; the fires, more than two days, and the destruction of the villa was total. Guernica had no military significance and the act had no justification from the point of view of international opinion. For this reason, Guernica became a kind of Hiroshima, another icon of the infamies and aberrations of war. That same year, after the fatal event, Picasso was invited to participate in the International Exhibition of Paris. The Exhibition, called the Arts and Techniques of Modern Life, expected to demonstrate that art and technology were not opposed, while at the same time attempted to promote world peace. In two months, in response to the invitation, Picasso painted the huge picture measuring 7.75 meters long by 3.50 meters high. The idea did not come at once. 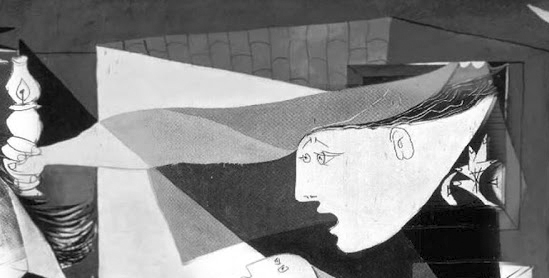 Picasso made many changes, photographically recorded by his lover then, Dora Marr. Picasso worked with astonishing confidence, that´s why he was able to accomplish such a masterpiece in two months. The researcher José María Juarranz, who dedicated the last 14 years to explain the Guernica, thinks that Picasso never intended to paint what had happened in the Basque village. The poet Paul Eluard had the lucky idea to title the painting "Guernica". According to Juarranz, Paul Eluard pronounced its name in front of the canvas during a visit to Picasso's workshop; He must have felt that the painting reflected his poem The Victory of Guernica. Many artists know how important a work of art title is. Sometimes the title is responsible for giving to the work its full meaning. Titles not only possess the same power that names have to identify people, but also they create expectations, suggest meanings, induce conclusions or contradict what is seen in the image. The title is a kind of conceptual framework of the work, belonging to the context, and can reveal the intention of the artist. If we see a situation of war in Picasso's enormous painting it is partly because we know the story behind it and recognize the name "Guernica" as an icon of destruction, injustice and war. The meaning, the symbolism of each element of the picture, has been and still goes through endless discussion. There are complete books on the subject, and quite a few that show that people like to interpret beyond what is in the picture, making thousands of objective and subjective considerations. In 1947, in New York, there was a symposium to interpret Guernica, with papers by several experts: Alfred H. Barr Jr., Jose Luis Sert, Jerome Seckler, Juan Larrea, Jacques Lipchitz and Stuart Davis. "My work is a cry of denunciation of the war and the attacks of the enemies of the Republic legally established after the elections of 31 (...) No, painting is not made to decorate apartments. It is an instrument for offensive and defensive war against the enemy. The Spanish war is the battle of reaction against the people, against freedom. In the mural painting in which I am working, and which I have named Guernica, and in all my last works, I express clearly my repulsion towards the military caste, which has plunged Spain into an ocean of pain and death. "1 Pablo Picasso, 1937. Women and children are the innocent victims of wars. Picasso painted two women, one at the left and one at the right. The one on the left carries her dead son, we know it by the position of the head, and the one on the right, trapped in the flames, screams desperately in an immobilized posture. 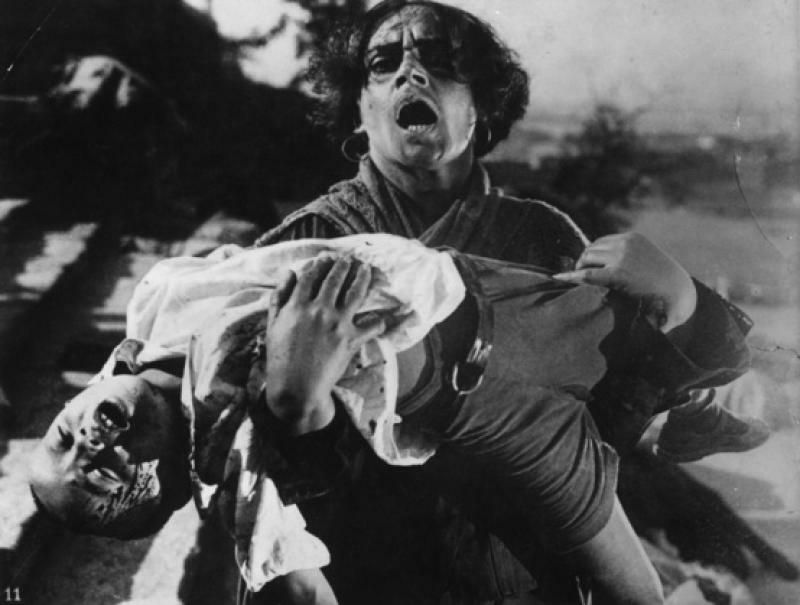 Some experts believe that the drawing of the mother with her dead son may have originated from a scene from a film, Battleship Potemkin (1925), by the Russian director S. M. Eisenstein. Picasso loved movies. The other two women in the picture direct our eyes toward the center of the painting. One looks at the horse from below, the other looks at the general scene from a window and with the lamp illuminates what appears to be a night scene. We know this, not only by the lamp, but also by the bulb that is in the upper part of the painting, almost in the center; it is also insinuated by the touches of light, constituted by the white color over the dark elements of the painting. It is possible that the woman with the lamp thrust out of the window evokes the statue of liberty; especially if we understand the gesture and the way the arm that holds the lamp has stretched. There is also an element that reinforces this idea, even if it is not located where it is expected: the sparkling triangles of the bulb. 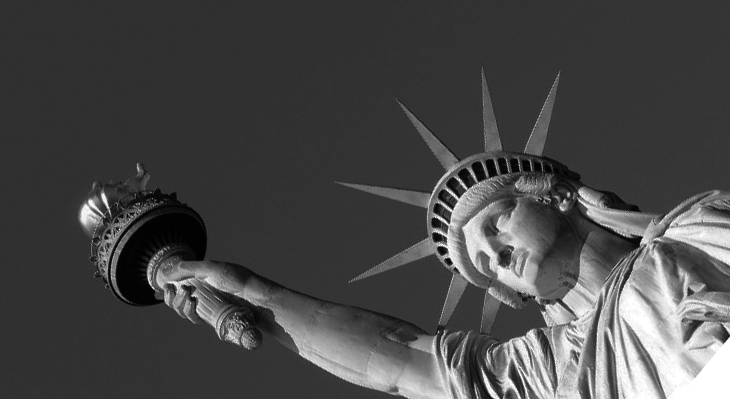 They are similar to those of the crown of the statue mentioned, but turned upside down. The woman on the ground, half naked, seems to crawl; she has her breasts in the air. The body breaks into fragments that increase her imploring gesture. The feet, deformed and naked, add information and the feeling of desolation and loss of everything. The man, as might be expected, is half dead, dismembered, with a broken sword in his hand, obviously a symbol of struggle. The flower is there as a primary symbol of life and hope. He shows his teeth, like one that has fought until the end. His arms are extended in the shape of a cross. He is the representation of sacrifice. The body of the bull is black and the head and tail are white. The tail seems to be on fire. The bull looks at the viewer. The bull, the horse and the woman carrying the child have their mouths open and their tongues out. The tongues indicate a sound that is not the cry "ay" but "ahgrr", a guttural sound, of pain, of dread. The bull and the horse are contorted: their bodies are directed to the right and their heads to the left. The horse is the most volumetric figure and also the most broken, most fragmented figure of the whole. The horse is falling, one of the knees touches the ground, and a spear enters his body. The horse is the largest and most impressive figure of the painting; in addition, it is in the center, directly illuminated by the light coming out of the bulb. The horse's tongue seems an arrow leading to the dove. The dove, almost invisible, submerged in darkness, squawks into the sky. The image of Guernica demands time from the viewer, and long contemplation. It is not a picture that is delivered immediately, because at first it seems confusing, chaotic. Whoever is so makes it consistent with it message: in a war everything is confusing and disordered. Elements are mounted on top of each other, overlapping, and what lies ahead can be seen behind; transparency is vivid. When you see Guernica you have the feeling that the objects could be like cellophane or paper; in addition you will experience an unexpected sense of three-dimensionality. There are only planes, but they seem to move in space, they are everything, less static. Picasso was not only a creator - one can say that he is one of the few who fall into the category of genius - but he was ahead of his time, “finding” images that look like computer art, done with drawing software like Ilustrator (The word “finding” is used here because of Picasso's famous phrase: “I do not look for, but I find”). 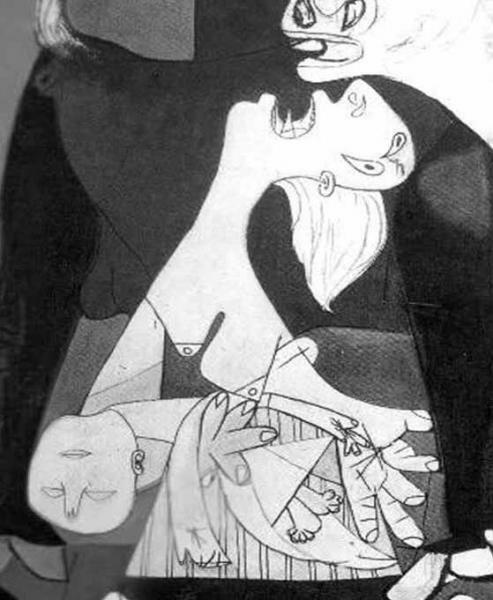 This image of Guernica, if it had been made today, could have been a product of the aforementioned software; a tool that permits us to delete, join, trim and exclude fragments of an object. Anyone who has played with it knows that unexpected images can be achieved, visually strange, incomplete, but with a certain aspect of continuity, as the tool allows completing contours in unforeseen ways; and pulling out figures from the background. Figure and background do not exist in cubism. Defining the background, filling the background has always been a problem for the painter, because for the human eye the background is simply everything that creates a contrast with the figure and allows "seeing" it. The cubists found an interesting solution: to suppress it. After observing the Guernica, one notices a predominant visual order: a triangle that goes from the upper half of the painting to the lower right and lower left corners. The composition is balanced by arranging two groups at these ends with more white, outside the large illuminated triangle that dominates the center of the composition. The picture disdains color, and one does not know if this is to recall or to allude to the news of the newspapers of that time. Not only does it not lose strength with this, but it wins. It is a huge painting, captivating and expressive down to the marrow. It embodies the essence of horror. The images of the comic are directed to the symbolic, abstracting visual information and unnecessary details. They are minimal, but highly communicative, as they go to the essence of meaning. They are very successful because they save energy in the process of understanding. Children and young people love them. Guernica is not painted in comic language, but takes elements of it. Picasso knew deeply the appalling strength of the schematic images over optical realistic images, the reason why he used them with forceful dominance. His painting concentrates our mind onto a tangible moment of violence and horror. And it gives us a synthesis of what is all war: nothing but crazy destruction and death. “Great nations write their autobiographies in three manuscripts—the book of their deeds, the book of their words, and the book of their art. Not one of these books can be understood unless we read the two others; but of the three, the only quite trustworthy one is the last”3. 2 Shlain, Leonard.Att & Fisics. Parallel Visions in Art Time and Light. New York, Perennial,1993, edición of 2001. Página 193. 3 St. Mark's rest; the history of Venice. (1877). To go to Martin's Sunset Intersection, press here.